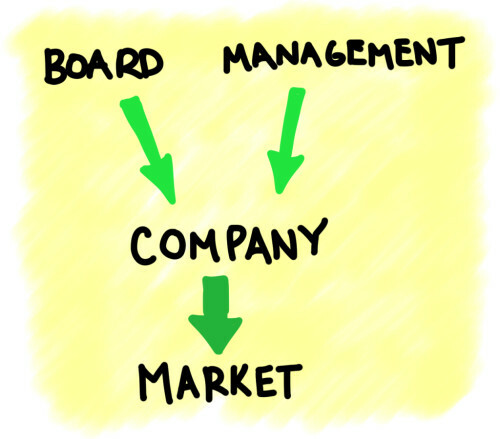 This is the first of a series of MBA Mondays posts on the topic of The Board Of Directors. I want to dig into the role and responsibilities of the Board as a way to kickoff this series. But first a few disclaimers. I am not a lawyer and I am not giving out legal advice on this topic. I am a practitioner and am telling you the way I see it and what I’ve learned over the years. I think both are important perspectives. You will have to look elsewhere for the legal view on this topic. The Board of Directors is the governing body for a company. All major decisions will need to be ratified by the Board. You will need the Board’s approval to sell your company. You will need the Board’s approval to hire or fire a CEO. You will need the Board’s approval to do a major acquisition. You will need the Board’s approval to do a major financing, including an IPO. On all matters of major strategic importance, the Board will need to be engaged, involved, and supportive. However, the Board should not run a company. That is the role of the CEO and his/her senior management team. The Board’s job is to make sure the right team is at the helm, not to be at the helm themselves. Boards that meddle, that get too involved, that undermine the management team are hurting the company, not helping the company. Boards work for the company. The company is their responsibility. They must always act in the best interests of the company and its major stakeholders; the employees, the customers, the shareholders, the debtholders, and everyone else that is relying on the company to deliver on its promises. Some would say that the company works for the Board. But I think that is wrong. The company works for the market (and I am using the word market in all of its meanings) and the Board and the management team work for the company. Every director must put the interests of the company first and their interests second. This is called fiduciary responsibility. About ten years ago, I was in a Board meeting when management told the Board that they had uncovered significant accounting issues in a recently acquired company. This was a public company Board. And these accounting issues had flowed through to several quarterly financial statements that had been reported to the public. Every Board member who was also a material shareholder (me included) knew that the minute this information was disclosed, our shareholdings would plummet in value. But there was no question what we had to do. We had to hire a law firm to investigate the accounting issues. We had to immediately disclose the findings to the public. And we had to terminate all the employees who had an involvement in this matter. Things like fiduciary responsibility seem very theoretical until you find yourself in a moment like this. Then they become crystal clear. Directors often must act against their own self interests. They must do the right thing for the company, its shareholders, and its stakeholders. There is no wiggle room on this rule. For directors, it is the golden rule. The hard thing about being a director is that many times, the right answer is not clear. Should we accept this extremely generous offer and sell the company? Should we ask the CEO to leave the company? Should we go public or wait a few more years? There are no formulas that you can run to tell you the answers to these questions. There is no “right answer.” Only time will tell if the right decision was made. And even then, there will be debate. Debate is what good Boards do. They put the key issues on the table and discuss them. Good directors are deeply engaged in the important issues and they are upfront and open about their opinions on them. They are respectful of the other Directors and listen carefully to opposing opinions. Boards should try to reach a consensus and then act on it. Board should not procrastinate on the big decisions. Boards need a leader to drive them. That leader is commonly called the Chairman. I plan to write an entire post on the subject of the Board Chair as part of this series. There are many CEOs who want to manage their Board. That is a mistake in my opinion. A great Board manages itself and treats the CEO as a peer and gives the CEO’s opinion great weight. But a great Board is not a rubber stamp. A great Board pushes the CEO and the company to make the most of the opportunities in front of the company. It makes sure that the CEO and the management team are pushed out of their comfort zone from time to time. It asks the hard questions that must be asked. Boards are fluid. They should evolve. Members should come and go occasionally. There should not be too much churn but some churn is good. Board members should not coast. Board members should not treat their seat as a right (even if it is). Boards should always be looking for new blood. I will end with a somewhat controversial statement in light of the way some of the most successful tech companies are run. Boards should not be controlled by the founder, the CEO, or the largest shareholder. For a Board to do its job, it must represent all stakeholders’ interests, not just one stakeholder’s interest. Next week I will talk about how a Board is selected, elected, and how it evolves over time. This article was originally written by Fred Wilson on March 5, 2012 here.